I found another Light Gun Game on the PS2! Light gun… On-rails. Shoot things. Shoot off screen to reload. What Ninja Assault does that makes it stand out a little, is that it has added a story mode. There are 4 modes, Arcade will take you through all the levels. But the individual stories for each character (Guren, Aoi, and Gunja) and from their perspective. 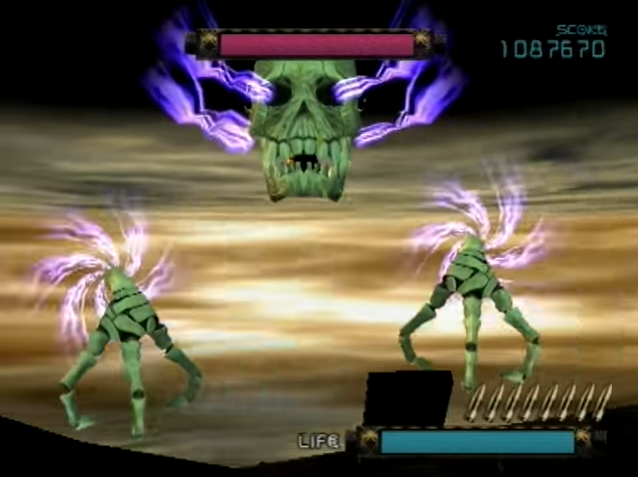 In this mode you to do slightly different missions, and each character has different abilities. Aoi is a female Ninja, she has more ammo. Guren is thin and male, he does more damage. 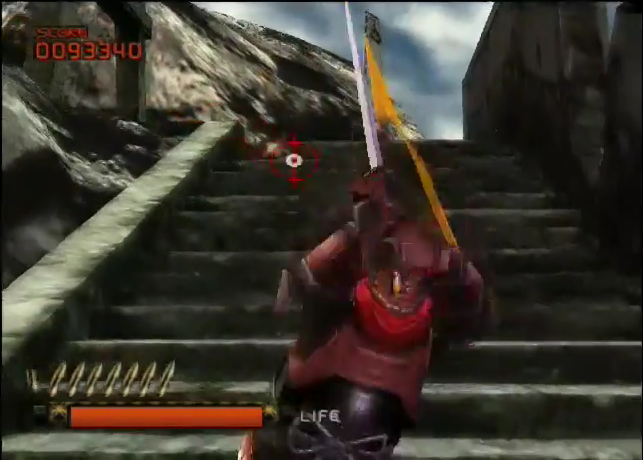 Gunja is fat and male, and can take more damage. They also get a different animation for their special move (but the moves do the same thing). It adds a little more life to the game, as it at least gives you a reason to play 4 times as some of the story missions do not appear in arcade. Once you beat the story/arcade missions, you can do a slightly harder Mission Mode, where you can choose levels and go for scores/times/learn all the secrets. Aoi doesn’t appear in the arcade mode, but has her story woven in to the storymodes. The final boss takes more then a little inspiration from Lylat Wars/ Starwing and that is it. 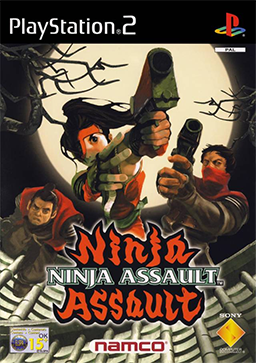 Ninja Assault is a decent shooter, the shooting is accurate and the story is enough to get you to the end. Don’t expect Shakespeare, just shoot things. The one flaw is that the game has a habit of not registering shots. Having played many light gun games on the PS2 I know my plastic guns work, on Ninja Assault it will occasionally think you’re reloading. It will mean the screen will flash like you’re reloading (and your bullets reload) but you’re trying to shoot the enemy. It means you will take cheap damage, and stops the game scoring in the low 80s. It isn’t as bad as a Mad Dog McCree or Lethal Enforcers, but the bugs stop it being a Time Crisis II. Instead, it is more on a par with Crypt Killer. Pros: Fun enough, accurate shooting. The story isn’t hot steaming garbage. I remember this being released, but I don’t think I ever played it. I do miss the days of light gun games to be honest. That would be awesome. Best I can think of is 2 gun 1 player mode with machine guns in Time Crisis II. 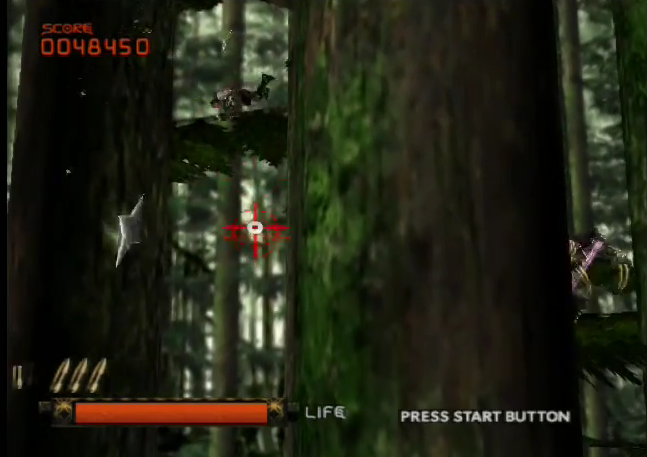 I have this same problem with shots not registering on an especially crappy PS2 lightgun game, Guncom 2. Very irritating.